New York has released partial tapes of emergency calls from the World Trade Center on 9/11 for the first time. Nearly nine hours of calls show the responses of emergency operators to callers amid the chaos of the attacks. The words of the operators - but not the callers - were released following a lawsuit filed by the New York Times and a group of victims' relatives. They hoped the calls would reveal what happened inside the towers and whether operators misdirected the victims. In 2004 a congressional inquiry into 9/11 said many operators did not know enough about the attacks to give the best information to those trapped. The city released partial recordings of about 130 calls made after the attacks that killed 2,749 people. A police operator saying a caller "states that on the north-west side (of the trade center), there's a... person hanging from the top of the building", to which the fire operator says: "All right, we have quite a few calls". An operator recounting a call from the 103rd floor of the building: "He says people are getting sick from the smoke that's coming in... There's a lot of people. He's thinking that they are trapped." An appeals court ruled last year that families should have the option to release the tapes made by 28 people who could be identified. On Thursday one of those, involving victim Christopher Hanley, was made public after his parents released it to the New York Times. 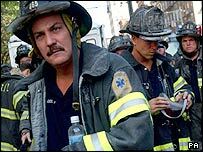 His call came four minutes after the first plane struck the World Trade Center. "Yeah. Hi. I'm on the 106th floor of the World Trade Center. We just had an explosion on the, on the like 105th floor," he said. "We have smoke and it's pretty bad," he said later, to which a dispatcher told him to "sit tight" and they were "on the way." "All right," Mr Hanley said. "Please hurry." The New York Times sought the records in 2002 under the Freedom of Information Act, and later sued the city when it refused to release them. The first transcripts released as part of the lawsuit came last August, when the city released thousands of fire department files. They included transmissions on the day and testimonies from firefighters gathered later.